So a guy I used to work with approached me shortly after I started working at my job when he found out I worked on old radios, and he inquired about a console he owned that had been in his wife's family. He was looking to sell it and was wondering if it was worth the $100 he was hoping to get out of it. I explained all the vagaries of mid century consoles and how much they might be worth and why. After several days I finally got him to get me pictures of it. It is a plane Jane el cheapo Admiral and after seeing it I told him if it worked it might be worth maybe $50. Well step forward several months and his wife was tired of it taking up room in their house, so he approached me again asking if I wanted it I could have it for free. I told him I would give him $25. We picked it up and brought it home. I found out that it is not as big as I thought, It is long, but it is only about 3 feet high and maybe 2 feet deep. I am not sure where he got the idea that it was working as someone had cut all the wires to the speakers and the interlock. This happened a long time ago, because some of the wires had green goo leaking out of them. It looked like someone had tried to Jerry rig the console to play from an external source to the speakers. The Record player looked to be in good condition, and has a sharp needle in it. The chassis was held in by only 3 screws, I blew off about 50 years of dust. I think it was made in 1964. I tested all the tubes with me Eico 625, The only tube that is questionable was the 19EA8. Not sure if it is bad or my tester doesn't test it right, or what exactly. It measured Weak in both tests. I checked over the circuit board and did not see any obvious defects. It took about 3 tries to identify the correct wires to input power (dim bulb testers are a life saver), as the wiring is cramped under chassis. I Identified the Proper speaker connections and hooked them up to my bench speakers. I powered it up on AM and it worked, I scanned the AM band quickly and everything is good there. I switched over to FM and did the same thing (all good). FM Stereo on the other hand is muddled, and the stereo light does not come on (I have not checked if it is good). There was NO hum on any band. I changed out my Dim Bulb for an amp meter and got around .3 amps reading. 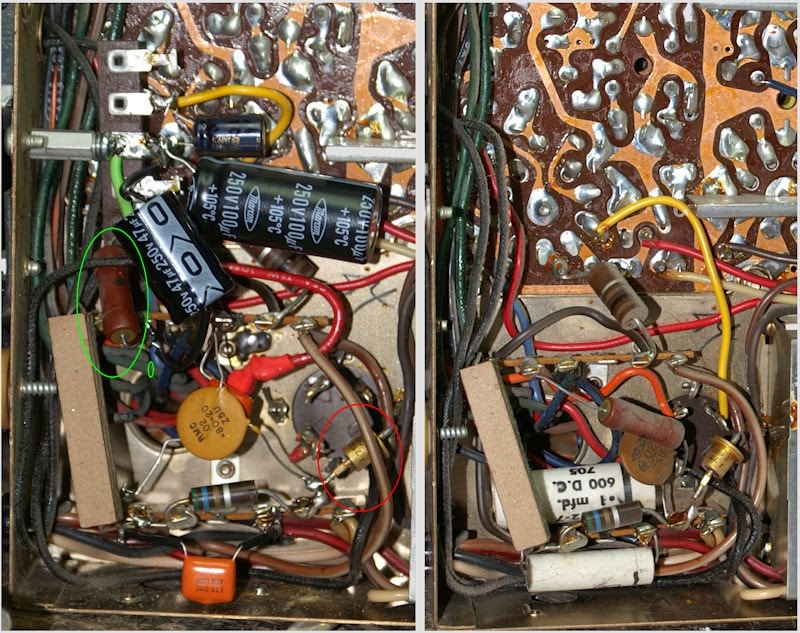 I rebuilt the power supply and replaced a cracked resistor circled in green on the right. I replaced several other capacitors on the main board. I needed a replacement stereo indicator bulb GE 49. The problem is "Radio" shack does not carry them. There is a local place here called Lighting Unlimited, but my experience on old style bulbs is that they are more like "Lighting Limited". The it struck me. This thing puts out 2 volts, 2 volts DC.... Hmmm, let me think. LED. AH HA! I took the old bulb, broke the glass, de-soldered the bulb and melted out the epoxy or whatever holds the bulb in. I Soldered in it's place an old red LED I had. It works perfectly and unless there is some kind of power surge, will probably last forever. I also did a complete AM and FM alignment. Reception improved some, but stereo was still messed up. With some suggestion from a forum I fed a 19KHz signal directly to the input of the stereo decoder section, by doing that I was able to complete the Stereo alignment. When I later got a Leader LSG 231 FM stereo signal generator, I was only able to improve the FM stereo alignment slightly better. 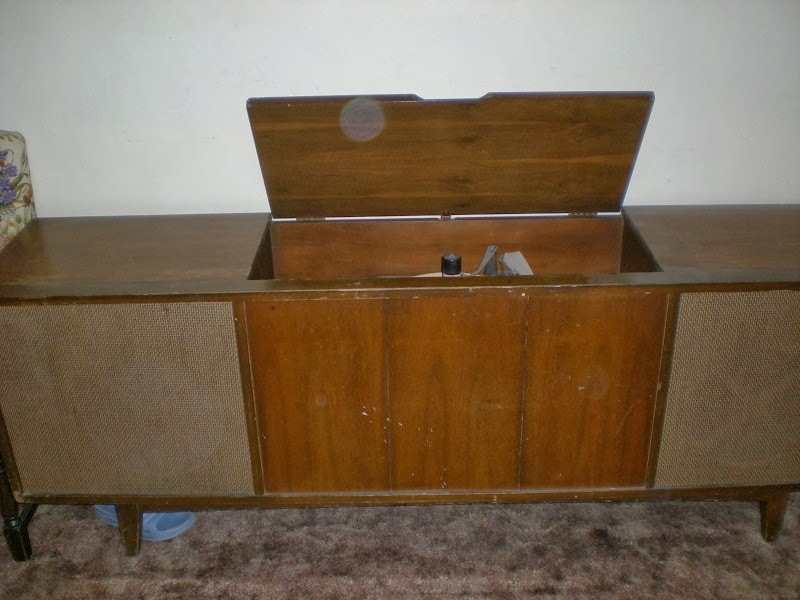 At some point I need to refurbish the Record player and then decide what to do with the cabinet.